The long-finned bannerfish is a fish with a body compressed on the side. 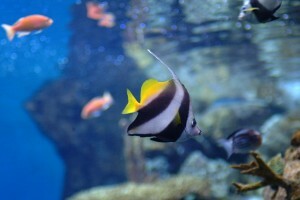 It has a colouring with two black and white transversal bands, and yellow caudal, pectoral and second dorsal fins. The dorsal fin is long and reminds us of a banner or flag. It has a beak-shaped face. Its maximum size es 25 cm. This fish usually lives alone or in a couple and rarely in small groups. It feeds on zooplankton and benthonic invertebrates. The young may be cleaners of other fish and eat their parasites. It is oviparous and lays pelagic eggs that float freely in the water. It lives on the coral reefs at a depth of between 2 and 75 m, although it is usually at some 15 m.
This fish lives on the coral reefs of the Central and Western Indian and Pacific Oceans. It is ordinarily called the bannerfish due to the large dorsal fin that reminds us of a raised flag.